These are the typical properties of various fibres used at CompoTech. Glass fibre, Aramid or “Kevlar”, Polyacrylonitrile or PAN Carbon Fibre is the common Carbon Fibre and is used in Aerospace, Formula 1, Sporting Equipment and many other applications. Pitch Carbon Fibre is also known as Graphite Fibre is made from a different precursor to PAN Carbon Fibre. Pitch Carbon Fibre is made from Coal-Tar Pitch and has a very much higher Modulus of Elasticity. Pitch Fibre is not as strong as PAN Fibre, but strong enough for the high stiffness applications that it is good for. 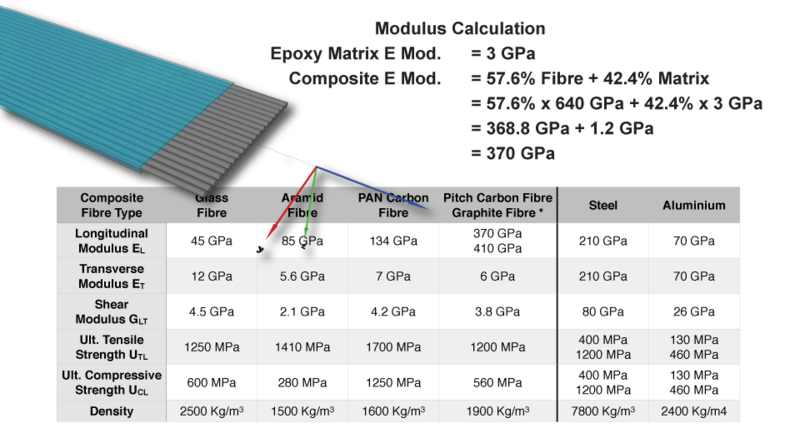 There are various grades of all fibres, but even the highest modulus PAN Carbon Fibre Composite is never stiffer than steel. PAN Carbon Fibre Composite is much stronger than steel and a component can be made stiffer than steel by increasing the section modulus. Composites made with Pitch Fibre can be as much as twice the stiffness of steel, whilst at the same time being about the same strength. Pitch fibres, however, are much harder to process because they break very easily. CompoTech have developed reliable methods to process pitch fibre and are able to use the stiffness advantages, especially when making components for Machine Building. Making a Pitch Fibre Composite to the same thickness as a steel plate it is possible to make a Composite nearly as stiff as steel… Ex 150 Gpa, Ey 150 Gpa, Gxy 50 Gpa. If the thickness of the Steel Equivalent composite is increased by 30%, i.e. 6mm > 8mm, then the same stiffness is achieved, but the weight of the composite is still one quarter, 25% the weight of steel.